Most children attend a local primary school, These are St Anthony's CE, St Vincent's RC, Tyneview, Welbeck Academy, West Walker, Walkergate and Wharrier Street. The two main Secondary Schools which service the area are Benfield School, a specialist Sports College, and Walker Riverside Academy, a high performing specialist technology and visual arts school for 11- to 18-year-olds. In August 2018 it was announced that two high-rise blocks, Titan House and Hexham House were to be demolished. The flats and neighbouring Church Walk shopping centre will be replaced by a new housing development and shops. 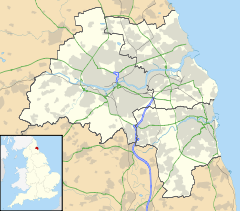 ^ "Newcastle-upon-Tyne ward population 2011". Retrieved 6 July 2015. ^ Eilert Ekwall, The Concise Oxford Dictionary of English Place-names, p.492. ^ "Armstrong Whitworth: Shipbuilding". Graces Guide. Retrieved 7 July 2017. ^ Walker, Walkergate and Walkerville: Miscellaneous articles. Newcastle City Library 1942.82 N537W. 1906. p. 35. ^ "Northern Echo" (Archived newspaper)|format= requires |url= (help). Darlington Public Library. 28 July 1908. p. 5. ^ Adams, David (1908). "The Planning and Development of the Walker and Willington Estates". Tyne and Wear Archives. Northern Echo. Retrieved 24 April 2017. ^ "Walker Park | Newcastle City Council". Newcastle.gov.uk. Retrieved 7 July 2017. ^ "Happy Birthday Lady Stephenson Library!". City of Newcastle. ^ "Welcome to Tyneview Primary School". Tyneview.newcastle.sch.uk. Retrieved 7 July 2017. ^ "Welcome to West Walker Primary School". Westwalker.newcastle.sch.uk. Retrieved 7 July 2017. ^ "Walker Riverside, Newcastle, 2003 to 2018". Future Communities. 28 November 2008. Retrieved 7 July 2017. ^ "Featured case studies / Walker-Riverside, Newcastle". Retrieved 8 July 2017. ^ Alastair Craig. "Pupils stage farewell show for Walker primary school". Chronicle Live. Retrieved 7 July 2017. ^ "Gonna Send You Back To Walker by The Animals in Newcastle upon Tyne, England". Songplaces.com. 20 August 1996. Retrieved 7 July 2017.